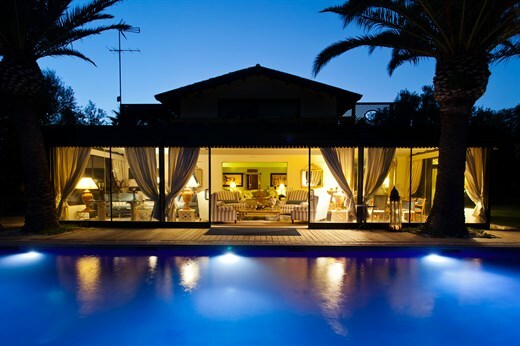 An extraordinary villa with an irresistible heatable pool immersed in seven hectares of private sea-view nature reserve. Sighilli occupies an enviable position at the heart of Vendicari Nature Reserve, whose sublime seafront habitat comprises salt lakes, sandy beaches, vineyards, a wide variety of coastal flora, and an internationally-tinted range of fauna, including flamingos and sea turtles. All in all a truly unique context for Sighilli’s very own brand of Epicurean luxury. "Our family of 14 happy adults stayed at Sighilli for 4 weeks of unadulterated bliss! We’ve been making these special celebratory get-togethers every other year for ages and we’ve unanimously agreed that The Thinking Traveler created the perfect time for all of us. To begin - gorgeous Sighilli is supremely situated within a lovely nature reserve, ensuring both total privacy and absolutely stunning beauty. Orchards, vineyards, sea and beautiful birds all created a sense of serenity. But the most glorious part was the extraordinary villa itself. Complete with the most advanced technical advantages (such as electronically controlled sliding glass doors, to beautiful, unusual furnishings, this home is just that — it’s a HOME, not a house to be rented out. Every touch reflects love and care by an astute owner who obviously has created his dream. The staff is absolutely unbelievable. They couldn’t do enough for us. Each one treated us as though we were their invited guests. The meals were fantastic - prepared exquisitely and deliciously to our tastes each day. They even took delight is gifting us with ever-so-special treats, such as a sublime carrot cake a Moroccan tagine. They also seemed to delight in surprising us with bowls of shelled almonds from Sighill’s own orchard. The beach retreat was a real knock-out… our own private lido, fitted with showers, bathrooms, loungers, umbrellas, grills, refrigerators and even wonderful gazebos and tents so we could spend all day. 3 of the bedrooms at Sighilli have double beds plus an additional single bed meaning that these could be prepared as a twin on request or for a child (within the maximum occupancy of the villa). Inside: accommodation at Sighilli is spread over the main house and a guesthouse. Much of the ground floor in the main house is given over to the sumptuously furnished living areas, which include a large conservatory overlooking and accessing, via enormous sliding glass doors, the dreamy pool area. To one side of the living areas is the large indoor dining room, served by a well-equipped kitchen. The ground floor is also home to three of the main house's four suites, each of which has its own "hammamesque" en-suite bathroom. The first, a double, offers an in-bedroom sunken Jacuzzi bath, a walk-through rain forest shower room, a separate WC and access to the gardens via sliding glass doors. The second and third suites both comprise a double bedroom, a sitting area, a bathroom with Jacuzzi bath and separate shower, and large sliding glass windows accessing the surrounding gardens. The fourth suite in the main house - the master suite - is situated on the first floor and accessed via an external staircase and a terrace with small gym. On entering this bedroom, one's eye is immediately drawn to the floor-to-ceiling, wall-length sliding glass doors that lead out to a private terrace with stunning views over the surrounding vineyards, the salt lakes and out to sea. Apart from its impressive bed, the master suite is furnished with sofas from which to watch TV or gaze out at the views (you'll probably end up doing the latter!). Its en-suite bathroom, which would make an Ottoman Emperor proud, includes a Jacuzzi tub, a separate walk-in shower and a Turkish bath. Decoration, fittings and furnishings throughout the main house are a combination of the opulent and the exotic, an eclectic mix of Moroccan mother-of-pearl inlayed objets d'art, Chinese porcelain, original oil masters, deep, cushion-laden sofas, enveloping, oversized armchairs and Byzantium-inspired bathrooms. The guesthouse, which is about 150m from the main house, is simpler in style but equally comfortable and welcoming. There is a large living area opening out onto a shaded panoramic terrace surrounded by the vineyard, a practical kitchen and three spacious double bedrooms with en-suite bathrooms. Two are on the ground floor and feature a day bed and a bathroom with a Jacuzzi tub and separate shower. The master bedroom, which is accessed via a spiral staircase from the living area, has a four poster bed, comfy sofas from which to watch TV or enjoy the views, and a very large, top-spec bathroom with walk-in shower. Outside: the main gate opens onto a long palm-lined drive that leads towards the house. Once parked, the final approach passes under a pergola avenue of fragrant Mediterranean climbers. Lawned gardens, planted with numerous varieties of trees, shrubs and flowers fan out around the property on three sides, eventually giving way to the wilder nature of the reserve, a vineyard and other cultivated land. The gardens offer numerous spots of sitting, reclining, gazing out to sea, dining, chatting and playing games (including table tennis and table football). The main house opens out on to a gorgeous, decked terrace with irresistible pool (which can be heated in spring and autumn) and plenty of space for soaking up the sun and taking in the hypnotic views. To the left of the pool, immersed in the gardens, is a large pergola with dining table, while to the right, the decking continues almost like a boardwalk down to a large sail-shaded outdoor living area and a second dining area. Beautifully illuminated at night, this is a magical spot for long convivial dinners and nightcaps under the moon and stars. The guesthouse has its own large furnished terrace. Lastly, on the first floor terrace outside the main house master suite, there is a gym with a treadmill and cyclette. Once you've explored Sighilli's grounds and gardens, swum in the pool and been transfixed by the views, you will find it extremely difficult to leave the tranquillity of what is indeed a sublime oasis. Unless, that is, you wish to spend some time on the beach. Sighilli has this eventuality covered too: a twenty-minute drive to the coast below Pachino will take you to the property's gorgeous, fully equipped private beach retreat (available from May to the end of September and included in the rental during this period). This is a truly unique property in a unique setting, the like of which we have not seen anywhere else in the Mediterranean. Please note that the private beach retreat is available between May and the end of September. With seven hectares of private nature reserve at your private disposal, and a further fifteen hundred hectares at your fingertips, you may not want to move very far. Although the beach is accessible on foot, passage is restricted due to the fact that sea turtles use the area as a nesting ground. The nearest beaches, therefore, are accessed from outside the property, just a few minute's drive and walk, and are rarely crowded (except in the height of summer). The nearest main town is Noto, the most easterly of a chain of baroque towns now protected as a UNESCO World Heritage site. It is also perhaps the most perfect of the seven towns, which were all rebuilt in flamboyant style following a major earthquake in 1693. Noto is also where you will find the best supermarkets, grocery stops and amenities. For dining, both Noto and Marzamemi, a very attractive little fishing village, have some excellent restaurants. If hiking in the hills is your thing, then there is some spectacular scenery in the rushing streams and waterfalls of Cassibile and at the Paleolithic burial sites in the dramatic gorge of Pantalica. Siracusa is just half an hour's drive away, and at least a day there is highly recommended to anybody spending a week or two at Sighilli. A little further afield, the other baroque towns of Modica, Ragusa and Scicli are also easily reachable for day trips. "Sighilli's location, land, and view were excellent! The staff was very helpful, nice and really wanted to make sure we had a good time. The in-villa cooks were excellent. On our last evening at the villa we booked a band, which was super fun and lovely pe"
Sighilli's location, land, and view were excellent! The staff was very helpful, nice and really wanted to make sure we had a good time. The in-villa cooks were excellent. On our last evening at the villa we booked a band, which was super fun and lovely people!! Our family of 14 happy adults stayed at Sighilli for 4 weeks of unadulterated bliss! We’ve been making these special celebratory get-togethers every other year for ages and we’ve unanimously agreed that The Thinking Traveler created the perfect time for all of us. I could probably continue for another dozen pages, but may I just conclude with the statement that NEVER have any of us ever enjoyed a totally luxurious, beautiful vacation as this was. Sighilli is amazing. The property is so unique and special, unlike anything we experienced elsewhere. The views and staff are top notch and the proximity to Ragusa, Noto, Marzamemi and Ortigia made staying at Sighilli even more spectacular. What a unique 5-star experience. The poolside area was fab. All four staff were really excellent and the food made for us at the villa was very tasty - lovely fresh local flavours that we all really appreciated. The local beaches near and in the nature reserve are great. We were overly pleased with the quality of Sighilli. We appreciated the flexibility of the staff and the in-villa cooks were perfect and served us a memorable dinner. The housekeepers at Sighilli were excellent and we were very pleased with their cooking and the meals they prepared and the shopping they did for us. We could not fault them. The rooms were very large and spacious and they were cleaned every day and were great. Our holiday at Sighilli was as good as could be. The staff was exceptional. I would like to thank them for the formidable efforts they put in to make our stay enjoyable. They are just naturally nice people. We enjoyed Sighilli. The cooks were marvellous. The position of Sighilli was beautiful and peaceful with excellent social areas. It provided the perfect environment for a group of old friends to relax togehter. The staff were attentive and firendly without being intrusive. What did you enjoy most about visiting Sicily? The villa! Honestly is was just too comfortable to leave. Especially with such a large party and kids, it was just so perfect and easy to dine there. The villa cooks were absolutely incredible and very good value.